Whenever I’ve talked about meteorites, I’ve always approached them from the perspective of a petrologist. I like to look at them from the angle of mineral composition, weathering grades and shock effects. This approach reveals a lot about the early history of our solar system. However, there are other scientists who look at meteorites, not as planetary building blocks, but as possibly carrying the building blocks of life. To me this is a pretty neat concept. The idea of meteorites being the building blocks of the planets and possibly the progenitors of life on our planet makes them all that much more fun to study. Last week I had the chance to hear most of a talk that was given by a Portland State alumni, Aaron Burton, about his work on meteorites in connection to the origins of life on earth. Unfortunately, I couldn’t stay for all the interesting chemistry because I had physics lab, but here’s a link to his blog where he talks about some of his research. He works at NASA-Goddard and part of his work involves making a meteorite “tea” out of a pulverized meteorite sample in order to identify the amino acids. Thankfully it’s for science, otherwise the idea of powdering a meteorite would reduce me to tears! I wish I understood the chemistry of amino acids well enough to talk about it. However, I don’t so I’m going to post a video from NASA-Goddard that talks about this same subject. You know that moment in life when you stumble across an idea or an object that incapacitates your words and thoughts? When you know that you’re looking at something truly unique that few have seen? Having the chance to photograph this thin section was one of them. You see, this meteorite is a piece of martian basalt. Normally, neither one of those words would excite me. Basalt just bores me and Mars is an overhyped, rusted out piece of the same rock (blasphemous, I know- may the space gods forgive me). But this, this was a plastic slip-case covered piece of the Red Planet in the palm of my hand. To say it was a humbling experience would be an understatement. 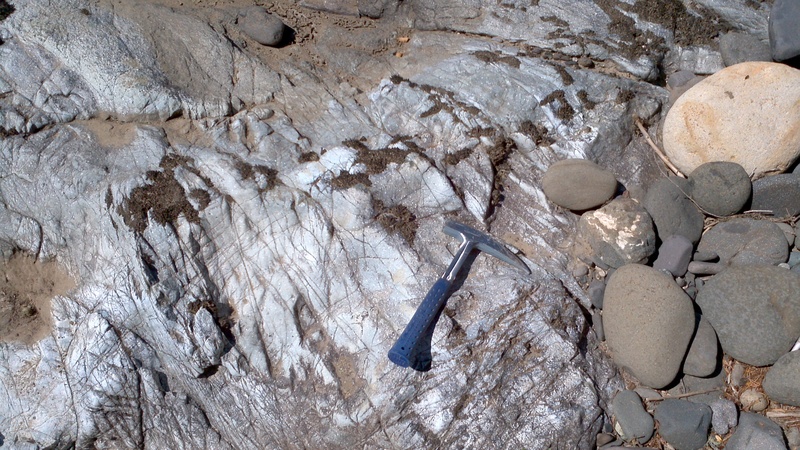 Shergottites are mafic to ultramafic in composition. For the non-geology folk out there, this simply refers to the mineral composition of the rock. Think of mafic as being shorthand for high in magnesium (Mg) and iron (F). These rocks are predominantly made from minerals that crystallized at great depths in the martian crust. Such minerals would include olivines, pyroxenes and some plagioclase. In the case of this shergottite, we’re looking at all three minerals. The opaque minerals are mostly pyroxene with some olivine and the transparent ones are a type of plagioclase called maskelynite. This mineral is really neat because it looks like glass under different microscopic views, but it’s chemical composition betrays it as a member of the plagioclase family. The current hypothesis is that maskelynite recrystalizes from plagioclase after being subjected to high pressure in a very short amount of time. These conditions are created from large meteorite impacts that generate shock waves and melt the plagioclase. Consequently, maskelynite has been found at impact craters on earth as well (1). If you’re curious and want to learn more, I highly recommend checking out the website for the Northern Arizona Meteorite Laboratory. 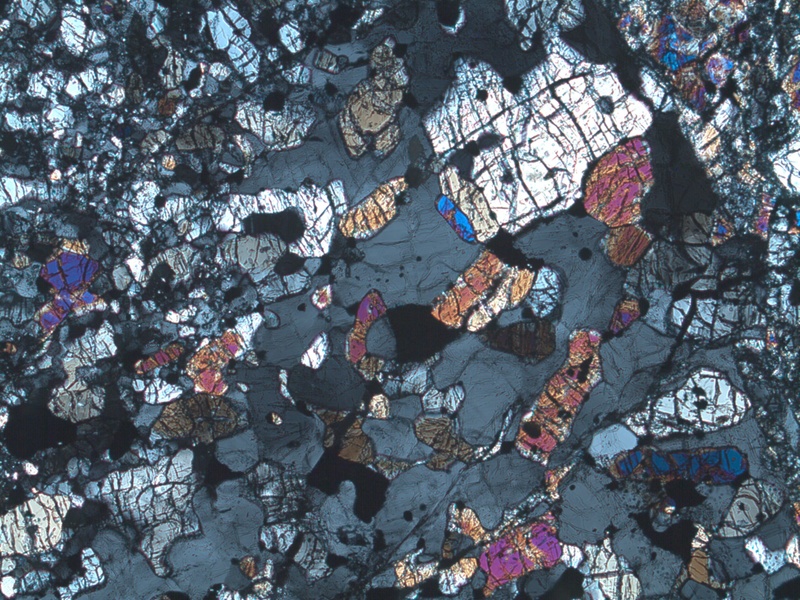 They have some gorgeous images of shergottites along with other meteorites. The information can get kind of technical because it contains the chemical breakdown of the minerals, but there’s still quite a bit that’s understandable without a science background. Here’s a really cool documentary about the Sikhote-Alin iron meteorite that fell in Russia in 1947. It was made by the Russian government, but has English subtitles. The film is about 10 minutes long and is actually the first part of an 18 minute documentary. Meteorites Australia posted this video to YouTube and has the full length documentary on their website. What I find really amazing is that Russian scientists were able to determine where the meteorite came from based on it’s trajectory and the speed at which it entered the earth’s atmosphere. 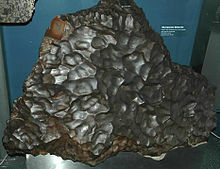 70 tons of meteorite crashed its way to the earth and is one of the more common pieces found in collections. That doesn’t make it any less spectacular though- after all, it is the core of a small planet that didn’t survive the early formative years of the solar system. Our families land and house in Glide. The Little River is to the left of the image behind the trees. About a year ago this month I wrote about the geology of Glide, Oregon. 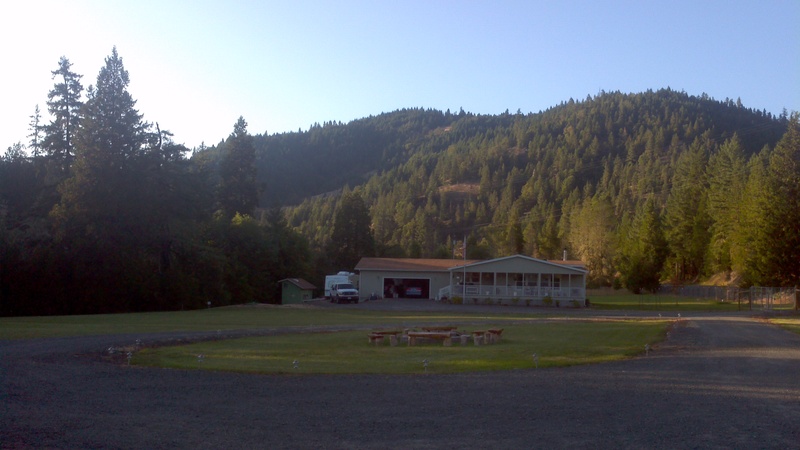 For those unfamiliar with the town, Glide is a few miles east of Roseburg in the Umpqua Valley of southern Oregon. It pretty much lies in the foothills off the Cascade mountains and it’s one of the last towns you’ll see heading out to Crater Lake on OR 138. My partners grandparents live down there and it’s been somewhat of a vacation spot of ours for the past four years. 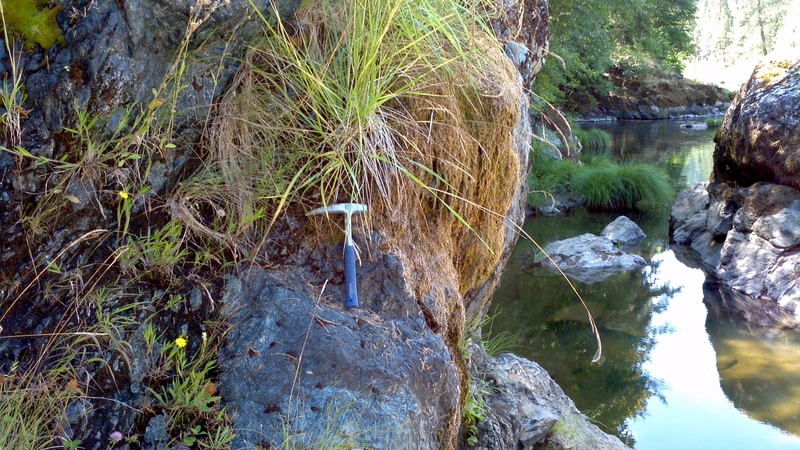 When I wrote that post I’d only taken two general geology courses and a three day field trip to central Oregon. I knew just enough about geology to sound intelligent to the lay person, but grossly misinformed to anyone who knew the difference between dacite and andesite. However, I didn’t let that stop me from trying to figure out the geology of the area. Every time we went down there, I brought my rock hammer, hand lens and a little bottle of hydrochloric acid to look for the signature fizz of a carbonate rock. I found the usual assortment of sedimentary river rock, more serpentinite, and rocks that developed a calcite band or crust from the flow of the river. One of the more unusual rocks I found was what I thought to be a piece of gneiss. It displayed the usual banding and as such I always referred to it as gneiss. However, on this last trip, I took a closer look at the rock and realized it was another piece of serpentinite sporting some gneiss-like banding. Since that first blog post, I’ve had geomorphology, mineralogy and petrology. The latter of which did more to help my understanding of geology than anything I had taken up to that point. It was from the petrology field trip to eastern Oregon that I learned about the power of observation- and by this I mean the capacity to unravel the mysteries of a landscape by looking at the various rocks and landforms of the area. It was on that trip and on this one to Glide that I realized geology is a balancing act. It’s equal parts understanding the land for what it is and what it was. Focus too much on one or the other and you lose out on the majesty and greatness of what you’re studying. 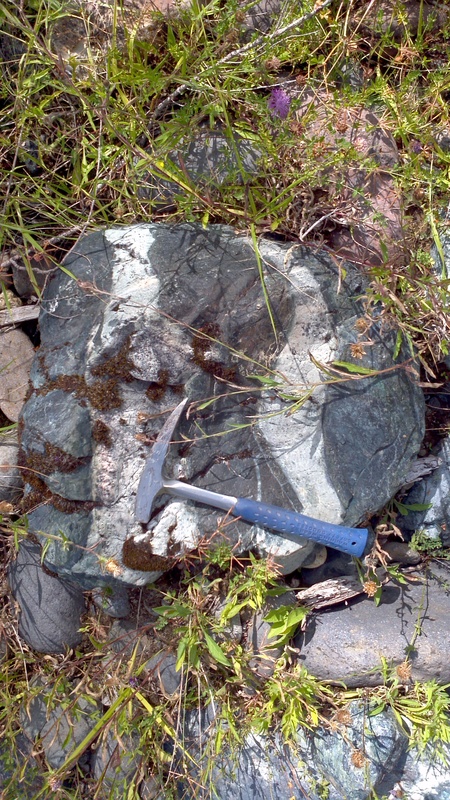 An outcrop of heavily weathered serpentinite. Apparently it gets quite a few visits from other geology students. With that experience and knowledge in hand, I decided to take a look at some of the outcrops around our families land. A few of the outcrops I figured were basalt. This was more assumption than observation. 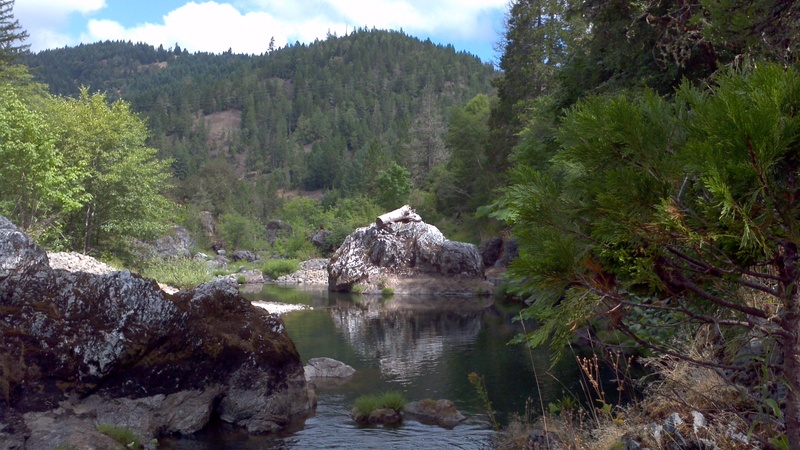 9 times out of 10, if you guess a rock is basalt in the state of Oregon, chances are you’re right. 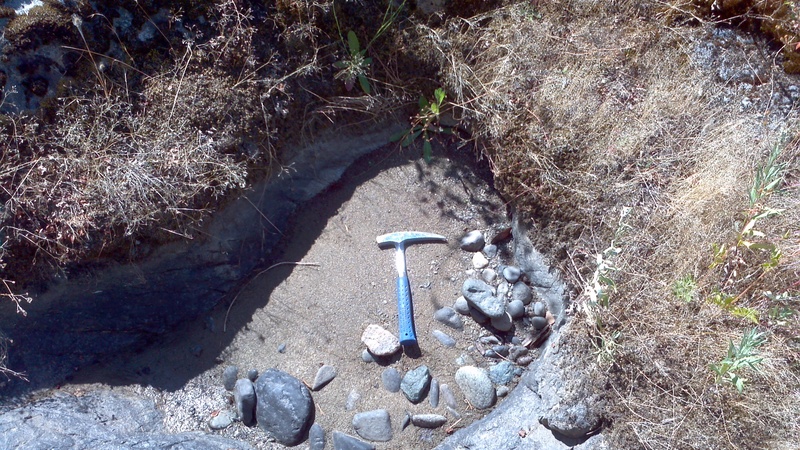 After some whacking with the rock hammer, I realized that the outcrop was composed of serpentinite. 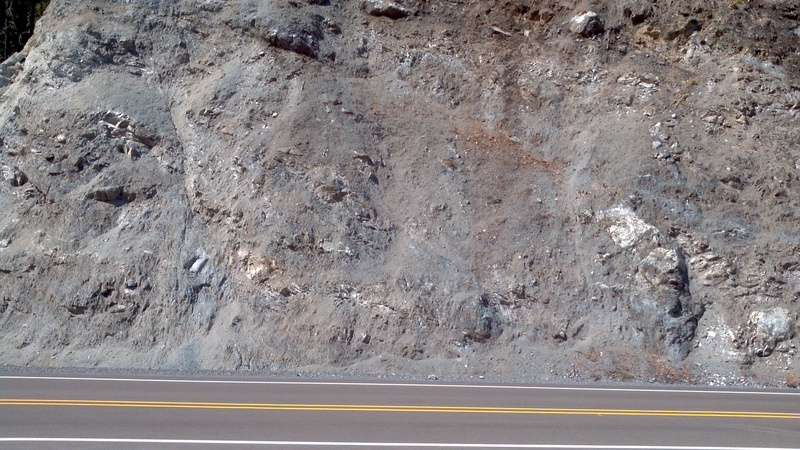 In fact most of the road cuts in the area were composed of serpentinite. And since this is ophiolite country, the odds are good that the rest of the hills are composed of unexposed sheeted dikes, gabbros and, dare I say it, basalt. Just not of the Columbia River kind. I’ve been fortunate enough to have visited Glide during all seasons and see the way the Little River affects the rocks and surrounding area. 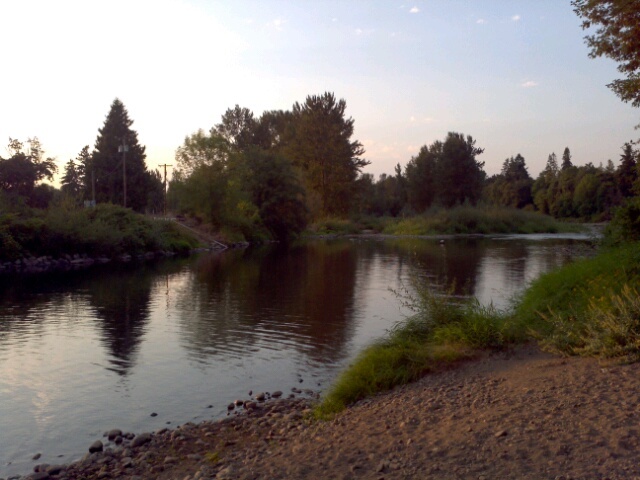 During Summer months, the river runs at it’s lowest and is great for swimming and finding rocks. In the Spring the river tends to run at it’s highest and possesses a deafening roar. One can see the cycle of the river by looking at the tops of the outcrops in the middle of the river. On this last visit I noticed tree trunks on these outcrops that stand at least 20 feet. When the water is low enough you can start to see scour marks and pot holes in the surrounding rocks. These are left by the pebbles and gravel of the river as they churn about in eddy’s from the fast flowing winter waters. The first time I saw those scour marks I was immediately reminded of the marks left behind by the advance of glaciers. Unlike glaciers though, rivers can also create pot holes in the underlying rock. I’m not terribly sure how it works, but I think it has to do with sediment getting trapped in the current and slowly being driven into the rock, much like a never ending jack hammer. One of the much larger pot holes in the river bed. This one comes just a few feet away from the previous picture with the scour marks. Now the point of this post isn’t to show off what I know or how much I’ve learned in the past year. In fact it’s quite the opposite. Regardless of the classes I take, the books I read, and the research done, there will always be something for me to learn. Doing geology, and science in particular, means becoming comfortable with the unknown and getting cozy with your ignorance. This doesn’t mean one should become complacent in their knowledge though. It just means for every piece of information you learn, there are at least a dozen other pieces of the puzzle that still need to be discovered. People don’t get involved in science because they know it all, but because they don’t know it all. 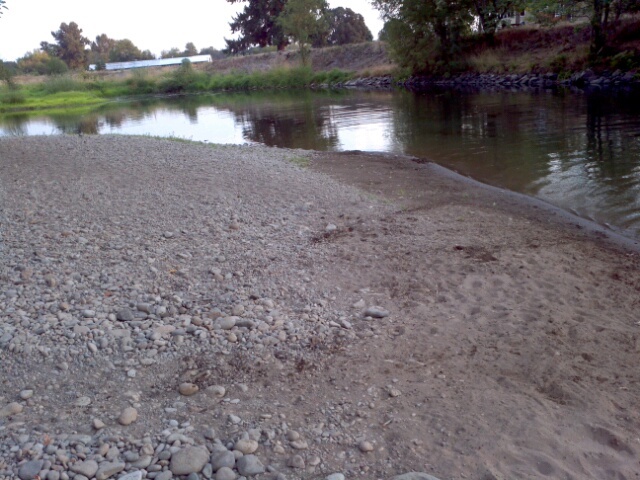 And it’s for that reason I will continue beating rocks and playing in the river bed when we go to Glide. It’s a great time to be a space science geek. Today NASA launched JUNO, it’s satellite mission to Jupiter that will further our understanding of the largest planet in the solar system. It’s scheduled to arrive at Jupiter in the summer of 2016 and will help us understand the formation of the solar system. In 2015, New Horizons will be snapping the first up close pictures of Pluto and possibly other members of the Kuiper belt. 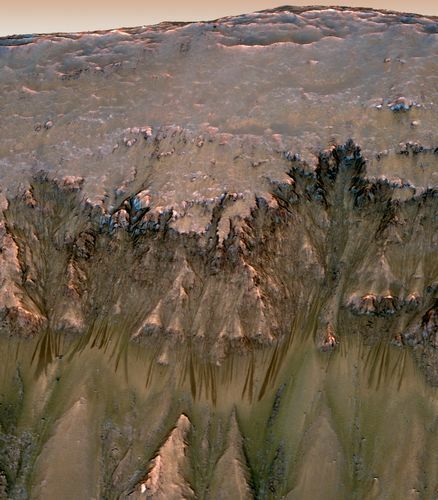 Yesterday, JPL announced (again) further evidence for water on Mars with this gorgeous picture. Let’s not forget the MESSENGER mission to Mercury either. 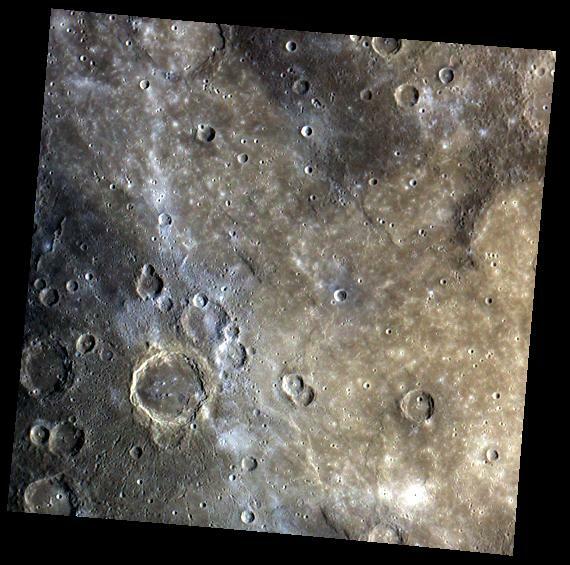 I feel that of all NASA’s robotic missions, this one gets the least amount of attention, yet it churns some really nice pictures that display Mercury’s violent past. As exciting as the aforementioned are, what really gets me going are the pictures sent back from the Dawn Mission. Dawn is studying two protoplanets in the asteroid belt- Ceres and Vesta. A group of meteorites called HED’s- Howardites, Eucrites, Diogenites- are thought to come from Vesta and this mission will fill in the gaps of information that the meteorites can’t. This mission, along with JUNO, will greatly further our understanding of the evolution of the solar system. It’s thought that Jupiters formation basically stunted the growth of Vesta, Ceres and even Mars by sucking up material needed for accretion. These images barely scratch the surface of what we’re accomplishing in our neck of the galaxy. There’s a long list of satellites that take beautiful images of our own planet, the moon and the sun. I didn’t even mention all the awesome information we’re getting back from the Cassini mission. Things may seem bleak for the science community with funds becoming more scarce, but we still have some reasons to celebrate what we do and further reasons to fight for what we do. One of my first tasks at the Cascadia Meteorite Laboratory is to photograph thin sections (PTS) for the samples that haven’t had any work done on them yet. 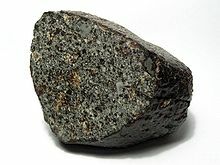 We have over 600 meteorites in the collection, a large number of which haven’t had PTS work done. I’ve photographed around one hundred of them so far and there’s plenty more work to be done. Doing this has been a great way to learn how to classify meteorites. 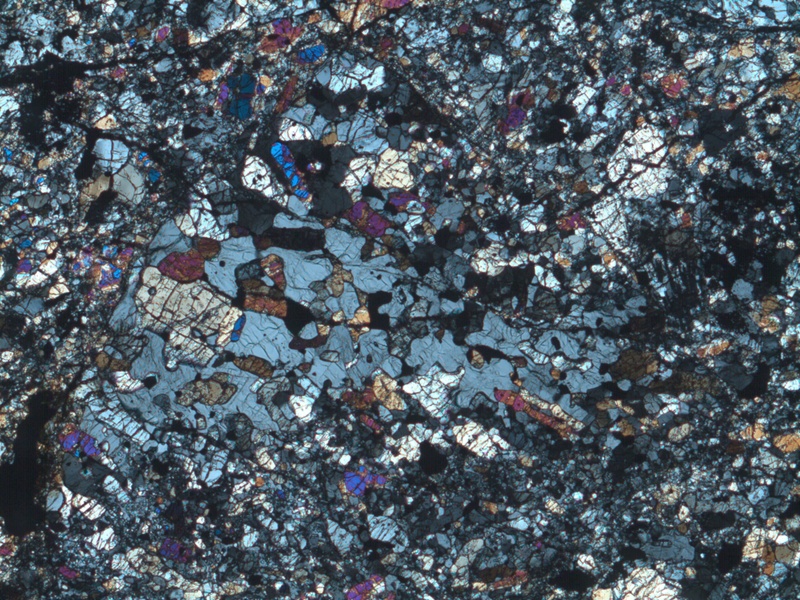 Just like with any terrestrial rock, meteorite classification starts with nothing more than a hand sample, a thin section and a petrographic microscope. The first thing you look for are the chondrules. Are they super crisp and well defined? Then you possibly have a type three ordinary chondrite. The presence of glass is also a good sign of a type three. If those chondrules are set in a rather dark matrix, chances are you have a carbonaceous chondrite. 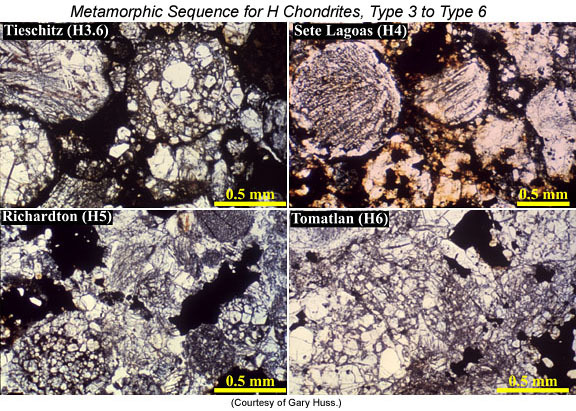 Type three’s and carbonaceous chondrites have seen the least amount of metamorphism (or thermal alteration). 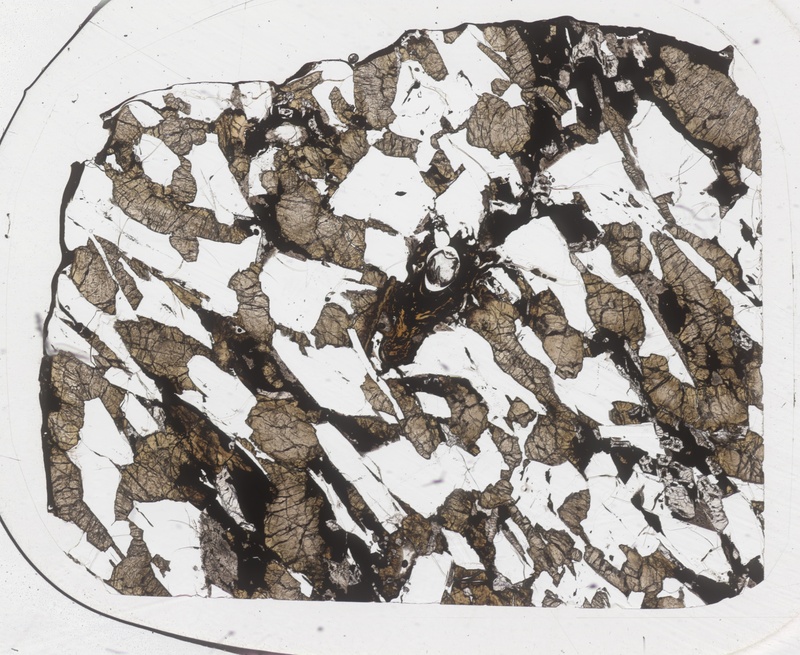 A carbonaceous chondrite thin section- those bright spherical inclusions are chondrules. Notice how apparent they are? 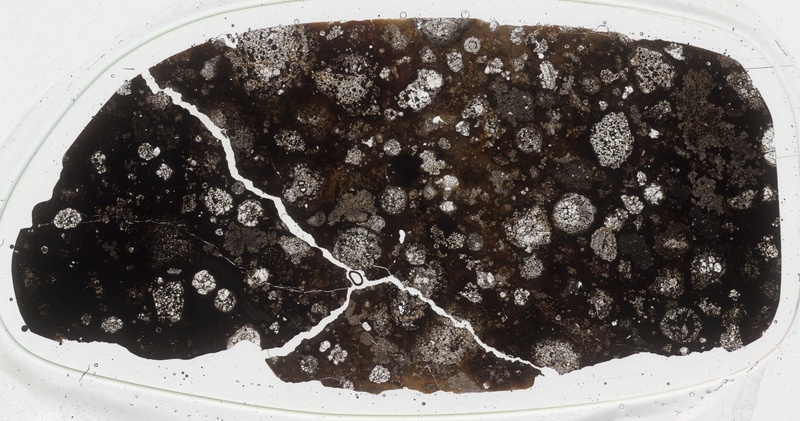 (Thin section from the Cascadia Meteorite Laboratory. Image taken by me). Once you get into the type four, five and six you begin to see an increase in metamorphism. Namely, your chondrules become less apparent as they basically get destroyed by the thermal process. At the type six level, the chondrites display relict chondrules. These are faint outlines of where a chondrule used to be- a ghost of its former self. Beyond the type six, there’s the type seven. I alluded to this in last week’s post, but didn’t really expand on it. The meteoritics community has been debating this one since at least the 1970’s with the publication of Pyroxenes in the Shaw L-7 Chondrite. I’m not going to delve too much into the type seven classification here. It’s a tricky one with the definition changing from researcher to researcher. As such, I’m going to address that in its own separate post. This week I decided to share a few more pictures from the thin section I wrote about last week. Unfortunately, I can’t give any great detail about what you’re seeing because, quite frankly, I myself am not sure what I’m looking at. Identifying minerals in meteorites is a whole different beast then that of volcanic and metamorphic rocks. To be sure, there is plenty of mafic minerals: mostly olivines and augites. At this point in my work at the meteorite lab, I’m learning more about the visual classification of meteorites. 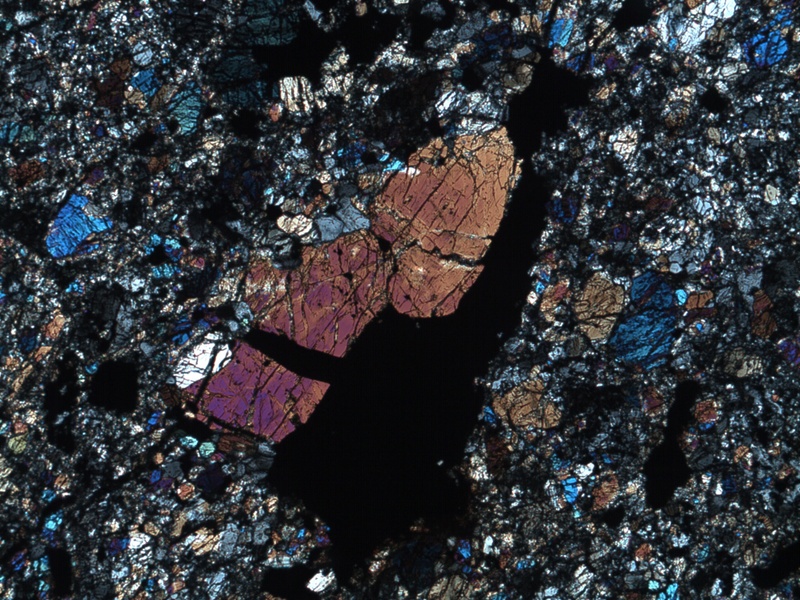 Are there plenty of well defined chondrules and glass? Then you probably have an LL3 (low iron, low metal). No chondrules and a fairly homogenous texture? Chances are it’s an L6, or if someone is feeling courageous, it could possibly be classified as an L7. Here's the same view, but in crossed polarized light. Notice the difference in detail? The plane light view doesn’t tell us too much, but when we go into the crossed polarized image, a few things become apparent. That interesting wedge really stands out from the rest of the sample. My initial impression of the grey/blue part was that it was some sort of melt that had cooled, kinda of like a glass. The only problem with that assumption was that glass goes black under cross polarized light. Alex Ruzicka, one of the professors that runs the lab, guesses that it could be plagioclase or even a phosphate. I get the feeling it’s something we won’t really know till we’ve done some SEM work on it. This next image is of the same area, but a higher magnification. Those minerals studded in the grey-blue mass are mafic in origin. My guess is that the minerals with the higher birefringence (the pretty, colorful ones) are olivines and that the large whitish ones are probably a pyroxene. 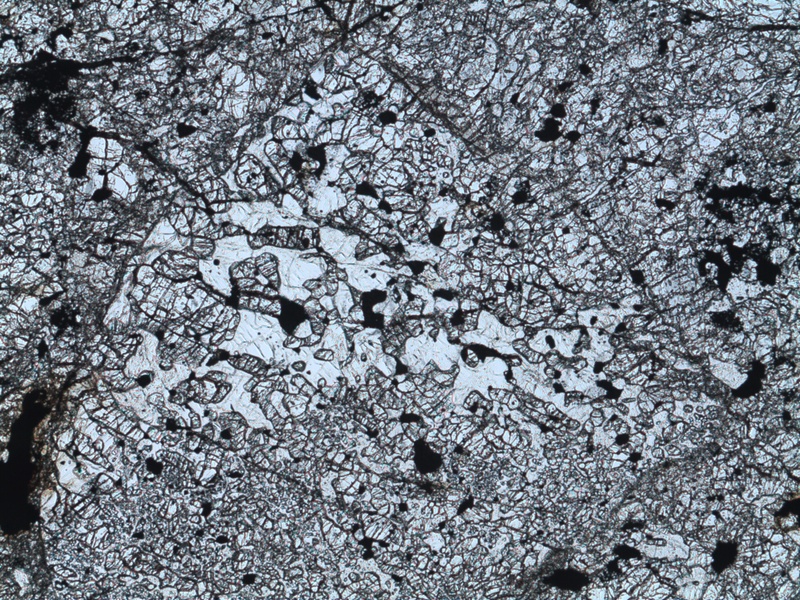 A cross polar image of the same area, magnified 10x. What I find really fascinating about this meteorite is that it’s brecciated. Each of it’s individual pieces record a different thermal history, and the lack of visible chondrules possibly indicates that each piece has gone through a high of metamorphism. I hope to understand the process more as I continue my lab work and studies. A large phenocryst- possibly an olivine.